As a Professional Organizer I feel my life is about planning. Planning appointments, planning vacations, planning carpools, planning meals for the week (btw – we all should be doing this on Sunday). With all the planning we do in our lives, why not plan to get organized? People do not like the process of organizing because they do not know where to begin. Organizing is like planning a party. You need lists, dates on the calendar, correct supplies, etc. With a plan, getting organized is easy, less stressful and highly gratifying in the end. Here are a few steps to planning your next quest for organization. Decide which areas are in most immediate need of organization and will provide you with the quickest organizational satisfaction. Once you see success you will be motivated to move on to the next project. Schedule a date on the calendar and treat it like it is an important appointment that cannot be changed. Ensure you record a start and end time so distractions do not give you an excuse to quit early. Setting an alarm is a huge help. Take a photo of the space before you begin organizing. Before and After pictures help you see your progress and celebrate your success. Ensure you have supplies on hand i.e. trash bags, boxes, bins, sharpie marker to label and a notepad. Pre-schedule a donation pick up date to ensure items to be donated leave your home. Or, at the end of your session, pack items to be transported elsewhere immediately in your trunk. Sketch your organizational plan on paper and create a list of items you need to purchase to compete the task. Schedule shopping date on your calendar right away. Organization is not a science. There is no right or wrong way to get organized. But without a plan, the process can prove disastrous and cause you to never want to get organized again. Don’t let that happen!! 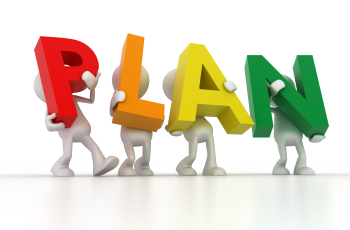 Simple planning will go a long way to organizational success! And, you can always reach out to your local Professional Organizer to guide you along the way.